Grape Aim (originally known as Silent but Deadly) is one of Mike's microgames found in WarioWare: Touched! in the Mic Rocking stage and returns as one of his microgames in WarioWare Gold. 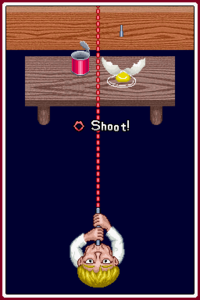 The game's purpose is to blow into the mic to hit items with a blowgun. The items can be an egg, a matryoshka doll or a can. It also requires twice the amount of time to complete. In WarioWare Gold, the player must use the blowgun to shoot the grapes, but must not hit the sun. 1st level difficulty: There is one item to hit. In WarioWare Gold, there is one man with grapes. 2nd level difficulty: There are two items to hit. In WarioWare Gold, there are two walls that cover up the grapes. 3rd level difficulty: There are three items to hit. In WarioWare Gold, there are two walls. There is also a man with grapes and a man with a pot. The player must shoot only the grapes. This page was last edited on October 12, 2018, at 17:33.